Next to the convent is the Plaza de San Francisco or San Francisco Square which took its name from the convent next to it, this square was built in 1628, with the objective of supplying water to the ships and facilitating trade within Havana City. For several decades it also served to stockpile the goods and merchandize arriving from the Havana harbor. Archives of the time say that the square had a prosperous commercial life and was a big asset to the then fledgling Havana City. The people, in humble carts or afoot, sold and bought a variety of goods from sea merchants displaying their imported goods. It’s also an important historical fact to that similar to Ellis Island in the United States, Spanish immigrants were logged and registered after their arrival in Cuba at this square. 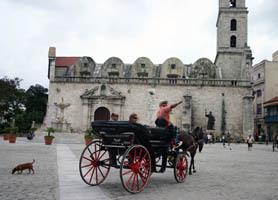 The Plaza de San Francisco square is now popular with tourists, featuring numerous Havana restaurants and café bars. It stands in front of the Lonja de Comercio and the Havana Cruise port.